PARIS, February 5. /TASS/. French President Francois Hollande told a press conference in Paris that Ukraine’s NATO membership would be "undesirable" for France and that Paris does not plan to supply arms to Ukraine. "We must state it clearly, we should tell other countries the truth, including about what we are not ready to accept. This is the position of France," he said. Paris is ready to do everything possible to prevent war in Ukraine by diplomatic means, he noted. "France does not fight in Ukraine and does not want to see war in Ukraine; we want to prevent war. 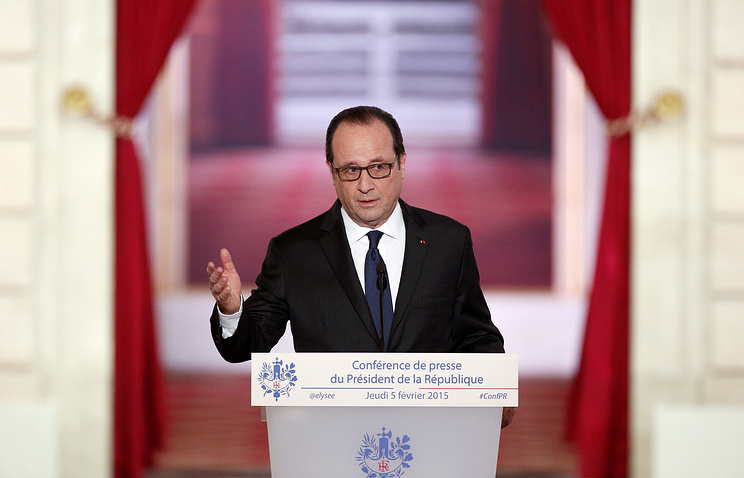 We must do everything possible in order for diplomacy and politics to gain the upper hand," the French president said. Earlier, Hollande said he would travel to Kiev with German Chancellor Angela Merkel on Thursday seeking a solution to the intensifying conflict in Ukraine’s south-eastern region of Donbass. On Friday, Hollande and Merkel will hold talks with Russian President Vladimir Putin. Presidential press secretary Dmitry Peskov confirmed the meeting. "I can confirm that indeed tomorrow (February 6) talks are planned between Putin, Merkel and Hollande," he said. "Leaders of the three countries will discuss what they can do to facilitate the end to the civil war in the south-east of Ukraine that has considerably intensified over the last few days and resulted in many casualties. ".